Here is a press release from Bettina which opened last October at 1014 Coast Village Road in Montecito. 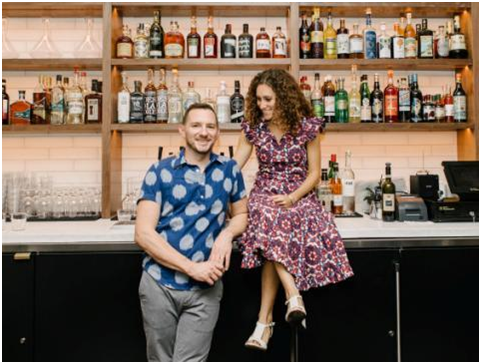 WHAT: Husband and wife team Brendan Smith and Rachel Greenspan present Valentine’s Day on Thursday, February 14, 2019, at their new restaurant, Bettina, located at the popular Montecito Country Mart in Santa Barbara. The evening showcases their exceptional farmers’ market-driven à la carte menu for romantics desiring an informal celebration for the international holiday for lovers. Bettina’s menu includes their signature naturally leavened Wood-Fired Bread with House-Made Butter (add-ons Fennel Salame & Pickles; Mortadella & Pickled Mustard; or Ligurian Anchovies); and Ricotta Crostini with Cara Cara Orange, Fennel & Pea Tendrils. Or try a Spuntini of Marinated Olives with Lemon & Thyme; Chicken Liver Mousse with Market Pickles; Fried Calamari with Aioli; Fried Cauliflower with Ranch; or Winter Squash Arancini with Calabrian Chile. Antipasto dishes are served with House Sourdough Focaccia and include Burrata with Swiss Chard & Hazelnut Pesto; Prosciutto with Marcona Almonds, Silk Chile & Olive Oil; and Meatballs al Forno with Harissa Tomato Sauce. Verdure & Secondi includes Roasted Carrots with Labneh, Pistachios & Sumac; Broccolini with Capers, Ricotta Salata & Pine Nuts; Wild Shrimp with Calabrian Butter, & Heirloom Beans; and Half Chicken Cacciatore with Coarse-Ground Polenta (for two). Pizza selections are made from Brendan Smith’s dough that is naturally leavened, made only with organic flour and fermented for a minimum of 48 hours. Specialties include Pepperoni with Mozzarella, Crushed Tomato, Chili Oil & Hollister Ranch Honey; Ricotta with Marinated Kale, Calabrian Chiles, Maitake Mushrooms & Pecorino; Sausage with Provolone Piccante, Crushed Tomato, Winter Greens & Olives; Fingerling Potato with Raclette, Pancetta, Radicchio & Green Onion; Chanterelle with Sottocenere Truffle Cheese, Mozzarella, Fontina & Thyme; Sunchoke with Aged Cheddar, Escarole, Torpedo Onions, Silk Chili & Sesame; Kabocha Squash with Ricotta, Mozzarella, Broccolini, Garlic, Parmesan & Crushed Red Pepper; and for kids – a classic Cheese Pizza. Pricing ranges from $5 – $15 for starters and $10 – $32 for Secondi and Pizzas. Expect stellar cocktail offerings perfectly crafted for Valentine’s Day and decadent desserts to share. Bettina will also serve its à la carte menus for lunch and dinner Friday through Sunday for those celebrating the holiday over the weekend. For reservations visit Bettina’s website or their partner reservation system Tock, or by calling the restaurant at 805.770.2383. Reservations recommended, walk-ins are welcome.